By Robert Agar-Hutton, Ex-L-Ence Publishing. As a publisher of both ‘real’ books (the old fashioned physical kind that are made from paper) and of eBooks, I watch carefully to see how things are developing. The obvious conclusion is that in a number of years from now, eBooks will be the norm and ‘real’ books will be reserved for specialist publications, maybe art books and some academic books. But is it really that simple? 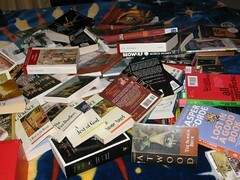 Yes, physical book sales have been dropping, with some reports suggesting a 9% decrease in 2012 as compared with 2011. But will the downward trend continue? Will it be linear? Will it be worldwide? The world is not technologically homogenous. There are hi-tech countries and ones that are not ‘tech’ at all. It is estimated that over 1 billion people in the world do not have electricity. So there are many places where physical books are currently necessary. I say currently, as because a future eBook reader (eReader) might be solar powered and might work via a wide area network to give access to information but that’s in the future, perhaps. Even in the most developed nations, the majority of people live in a tactile world, yes we are comfortable with Radio, TV, the Internet and no doubt we will also be comfortable with whatever comes next but equally most people like ‘stuff’, there is something nice about turning a page in a real book and there is something pleasurable about collecting, owning and displaying books. Your eBook reader can contain a huge library but only you can see it and to be brutal, that doesn’t come with the same bragging rights as your shelves full of bokks. So, perhaps real books will survive for quite a while. The eBook market is going to be the big brother, it will at some point (some sources suggest it has already) become bigger than the physical book market in terms of books sold, monies spent, etc. So the interesting question (for me as a publisher) is what books are going to do well as physical books and which need to be digital. Well since the eBook marketplace is young, it’s still developing and may, indeed will, change. At the moment we are seeing an interest in both fiction and non-fiction eBooks and in books of different lengths. As well as books of traditional length there is a market for much smaller almost pamphlet type eBooks which are high in information but low in cost, something that is easy to do with an eBook but which would not be cost effective with a physical book. The same low cost of publication favours those authors who want to publish extremely niche titles. Yes, ‘The Lord of the Rings’ by J. R. R. Tolkien has sold well in excess of a 100 million copies but a history of your family’s pet cats may only be of interest to you, your mother and great aunt Alice. The ‘cat history’ physical book is not cost effective, but as an eBook it can be. The next big thing will probably be interactivity – multi-media, linking of written books to other media like the spoken word and video and also linking books together. 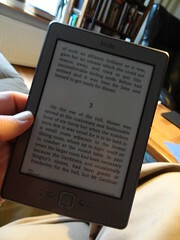 You can already query a word in an eReader and have a dictionary definition pop up, but perhaps soon, if a book’s plot takes the hero to Tokyo’s Daiba district, a quick tap of the finger will allow the reader to view a map of the area or other content, which will not be part of the eBook but will be automatically hyperlinked. Of course, future gazing is perilous at best, a new invention or a new paradigm could replace the eReader with something better or take a dramatic and better path to the sharing and assimilation of knowledge.